They say you can’t outrun a bullet. What if you could catch one? You might think that superpowers – being bulletproof for instance – are a matter of pure fiction. 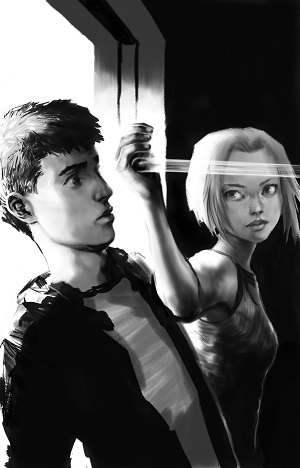 A fantasy of novels, movies and comic books. But they’re not… and I’m going to show you the evidence to prove that superpowers are real. For my new series, Bulletcatcher, I crossed the concept of Bodyguards with X-Men to come up with a team of gifted teenagers who protect the sons and daughters of the rich and famous in Terminus City. Each of these ‘bulletcatchers’ has a superpower, or ‘talent’ as it is called in the story. Now these talents – bulletproof, reflex, super strength, recall and blindsight – might all sound like Avenger-style super powers, but I wanted to ensure my story was grounded in reality. So I chose these particular powers because people actually possess them in the real world. For example, my character Lennox has the “Hercules gene”. This means he has muscles 25% larger and 50% stronger than an average human. A phenomenon known as being double-muscled in the real world and such children do exist, like this boy from Anhui Province in China. Watch the video here. My next character, Azumi, is totally blind. Yet she can see without her eyes and has the ability to glimpse into the future – a talent I term blindsight. There are many examples of people who have visions of the future, but what I found more amazing in my research is a blind boy called Ben Underwood, who could cycle, rollerskate and even play basketball, all by using echo-location like a dolphin! See here. And the more I researched into human superpowers, the more unbelievable the examples became. A boy who was like Magneto from X-Men, a baseball player with super-fast reflexes like my bulletcatcher Kasia and the most incredible yet… a man called John Chang who could set fire to objects using his chi (his inner energy). See the video here. The most important talent is the one that my hero Troy has: bulletproof skin. This sounds like a step beyond the realms of reality. But scientists have now created a skin made from goat’s milk packed with spider-silk proteins that can actually stop bullets. You can watch here. Their hope is that one day they can eventually replace the keratin in human skin – the protein which makes it tough – with the spider-silk proteins. Which means, in the near future, there might actually be bulletproof kids, like my hero Troy. Until then you’ll just have to rely on bulletproof clothing! So the next time you watch a superhero movie (or read my Bulletcatcher book), be aware that someone in the world may possess that power… and it could be you! See more amazing people with superpowers here. To read more about Chris Bradford’s research, visit the Barrington Stoke website. 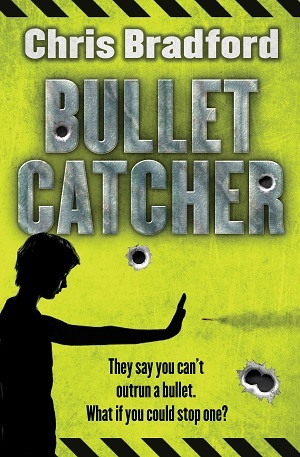 Bulletcatcher is published by Barrington Stoke and has a reading age of 8 years and a content level for 8-12 years. Buy it here or on the Amazon sidebar.